The 3-person Climb-N-Dangle was the first ever mobile rock climbing wall to be introduced to the commercial market. Several updates have been since its inception, but it still continues to be popular because of its light weight, economical price, and the best Auto-Belay system on the market. The Climb-N-Dangle is a cinch to operate. Two hydraulic lift cylinders stand the wall up at the touch of a button, so the wall can be ready to go in 15 minutes. The Auto-Belay allows one employee to supervise all 3 climbers at once for maximum through put. 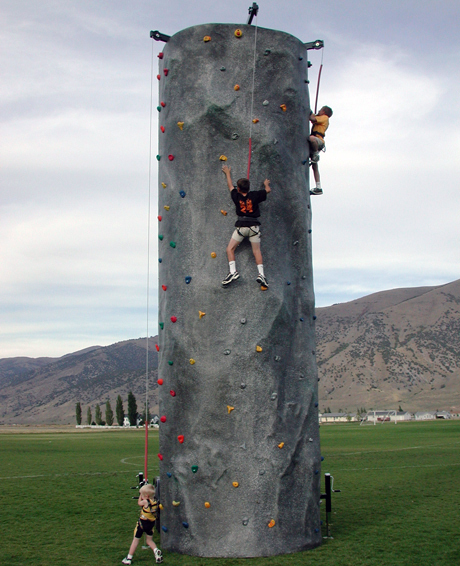 The Climb-N-Dangle is the perfect portable rock climbing wall for birthday parties, carnivals or fairs, schools, grand opening events, special promotions, fundraising, team building events, nightclubs, etc.